This salad is my pick of the bunch for a healthy lunch that will sustain you throughout your afternoon. New potatoes have a low GI, (and even more so when left to cool), and beetroot is not only high in high in antioxidants but also contains potassium, magnesium, iron, vitamins A, B6 and C, and folic acid. Walnuts are also jam packed with antioxidants and are a rich source of fibre, B vitamins, magnesium and omega 3 fatty acids. Boil the potatoes for 12-15 minutes until just tender. 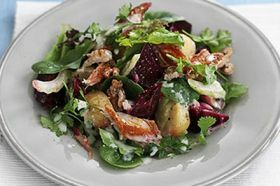 Flake the mackerel fillets into large pieces and cut the beetroot into chunks. Drain the potatoes and cool slightly. Mix the salad dressing and horseradish sauce together in a bowl and season. Add the still warm potatoes and mix well.